Has the Tide Turned Against Pegida? 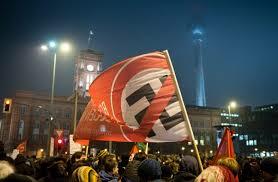 The expected rift in the anti-immigration movement in Germany began or became visible yesterday. After a concerted series of very large and determined counter-demonstration and a media onslaught, the numbers attending the Pegida rally in Leipzig (called Legida) signalled a peeling off of thousands of looser supporters, possibly appalled by the growing virulence of some of the leaders. As reported in the press, the main spokesman Bachmann threw in the towel after his selfie posing as Hitler went viral on the net. His co-organisers, including Kathrin Oertel, who I wrote about elsewhere, closed ranks against the damaging leader whose views most marchers would reject and find offensive. To make things worse for them, after the boast about being able to mobilise 60,000 for yesterday evening’s rally in Leipzig, only around 15,000 actually appeared. And these were outnumbered by a 19 separate counter demos that mobilized about 25,000 in all. Leftwing groups prevented the importation of rightwingers from Dresden by barricading autobahn approach roads and setting fire to dumpsters on the main railyway line. A tight counter demo also built a knot at the exit to the railway station, preventing travellers from joining the Legida demo. What is happening is that the broad populist movement, superficially against immigration but in reality against low pay, poor public and health services and the like, is starting to vomit out the neonazis who gleefully helped to build Pegida and it is reverting to the control of petit bourgeois and declassed elements who see no political party with power fighting for their interests. The party they regard as closest to their views is the new anti-Euro AfD party which has now a foothold in a regional parliament and which has embraced the movement. A quick survey of marchers about their voting intentions revealed that if they represented the whole population, the next parliament would have 95% AfD and 5% NPD lawmakers. Fortunately of course, there is only little sympathy for Pegida outside a small area of east Germany. The state has mobilised both political, moral and physical force against the movement. The political parties and Merkel have turned vocal in their rejection of the colour of the movement. Chat shows discussed and rediscussed the issues with Pegida consistently refusing to take part. Economic institutes explained the industrial and financial need for immigration. The churches and the unions made decisive public statements. Public institutions turned off the illumination of great public buildings, the normally conservative Bild newspaper carried a series of exposures and finally a large “round table” forum was set up to discuss with the rank and file. Cleverly the state also launched raids against Salafist nests. Add to these measures the mass active opposition on the streets of most major German cities, not just once, but repeatedly, and the physical defensive measures blocking and delaying of marches and we can understand the reasons for the abandonment by a mass of confused people of the pegida marches led by loose cannons of neonazis capable of insane tactics. It may take some weeks, but the tide seems to have turned. We can expect the growth of the AfD as the future political spokesmen to win seats in local parliaments. Nigeria: Black Lives Matter There Too! Capitalism: Kill it quick before it murders us all!